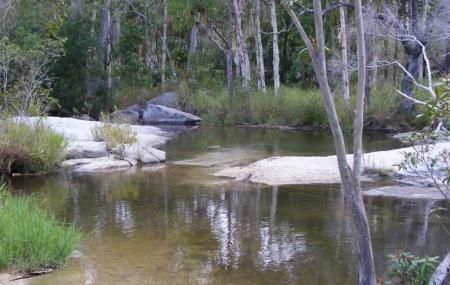 Find hotel near Davies Creek National Par ..
About 20km southwest of Cairns, this beautiful national park is located. The granite boulders, open eucalypt woodland with the beautiful Davis Creek Falls work as a perfect backdrop for the park. You can hike or walk on the walking trail as long as you wish. Beautiful colorful birds will be there to accompany you throughout your journey. If the surrounding nature makes you fall in love with it, you even stay by for camping. The park is occasionally closed during wet weather or for the management purpose. For camping, permission is required and need to have certain amount as fees. May to November is the best time to visit the park. Stay behind the barriers at Davies Creek Falls for safety. Be careful at creek crossing. Don’t go towards the cliff edge. Carry plenty of water and some food. Wear hat or apply sunscreen to protect your skin from sunburn. Fires are only allowed at the camping site. Do not bury rubbish. Instead take it away while moving out. How popular is Davies Creek National Park? People normally club together The Bat Hospital Visitor Centre and Stoney Creek Falls while planning their visit to Davies Creek National Park.